Carnegie: Magic Detective: Another Forgotten Illusion-OH! 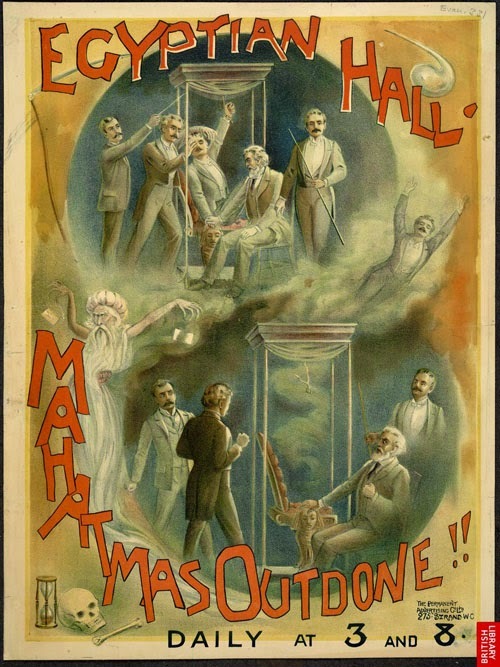 I am always astonished at the creativity of the old time magicians. Today when we think of illusions the first notion is some big box, which is usually correct. But the Victorian Magicians did not restrict themselves to mere boxes. In fact, the following is an example of very modern thinking, the props involved all look ordinary. The illusion is called 'Mahatmas Outdone' and it was also known as 'OH!'. The basic effect is vanishing a person in a chair under challenge conditions. This was the co-creation of Charles Morrit and Nevil Maskelyne. According to two sources*, the effect first appeared at Egyptian Hall on September 29th, 1891. Oddly, the British Museum lists the date for the above poster as 1877. I think the date is incorrect on the part of the British Museum actually. Morrit would have been 17 years old in 1877 and as far as I can see, he didn't make his stage debut until 1878. Interestingly, the Kellars Wonders book listed Harry Kellar as adding this trick to his act in three months after the Egyptian Hall debut. The book presumes that Kellar purchased the rights to the act as well as the rights to another routine he would add to his show. Oh! is a remarkable illusion which requires the assistance of at least three people from the audience. The magicians assistant sits on a chair and places one wrist through a ring which is attached to a cord. The end of the cord is held by one of the audience helpers. The assistants other wrist is tied or buckled to the arm of the chair and then the curtain is lowered and the assistant can put their wrist through a hole in the curtain, thus allowing yet another audience helper to verify that the assistant within in still there. A sheet of metal was slid under the chair to prevent the person from going through some trapdoor. When the magician gives the word, the volunteers raise the curtain, at the same time the hand that was being held is yanked inside the cabinet, but the second the curtain passes the height of the chair it's evident that the assistant is gone! Moments later the assistant reappears in the back of the audience! What an interesting trick. I love all these little convincers to prove that the person is still inside the curtained cabinet and then a second later, GONE! The effect was presented by a number of different magicians at Egyptian Hall and later St. George's Hall. And of course, Harry Kellar used the effect to great success in the United States. There is a very cool poster of the Kellar OH! chair in the Kellars Wonders book. In addition, Howard Thurston also performed the OH! Chair Illusion. I hate when I send these things out before I've done all the work! I forgot to check one source and now I'm kicking myself because this source was full of information. You see, I knew that one of the OH! Chairs was in the possession of Mike Caveney. I remember seeing a photo of it in MAGIC Magazine. It might even have been accompanied by an article, I don't recall completely. At any rate, Mike's newest book,Wonders and The Conference Illusions has an incredible amount of information. I forgot to mention, and thankfully Mike does in his chapter on the OH! Chair, that the Morrit OH! Chair was likely an answer to the popular DeKolta Vanishing Lady. The DeKolta Chair had been exposed in the press and in magic circles by the time the OH! Chair came along. Though they both used a similar method of vanish, the OH! Chair's convicers made it seem more impossible. In 2003, Mike Caveney recreated a presentation of the OH! Chair for the Los Angeles Conference on Magic History. He used Thurston's original chair. The chair by the way, had been restored by John Gaughan and the platform/curtain used in the recreation of the illusion was built by Craig Dickens. Labels: charles morritt, egyptian hall, forgotten illusion, Illusion, Maskelyne, nevil maskelyne, Oh! I believe Robert Harbin was a modern creative illusionist. The closest we have today is Jim Steinmeyer. Morrit and Maskelyne were prolific though. I agree, Harbin was a genius and Jim Steinmeyer is incredible for sure. Jim is a student of history and seems to have a fondness for Jarrett, Morrit and Devant. But he clearly has moved illusion magic forward by leaps and bounds. There are some new guys on the scene creating interesting effects, though they have yet to gain the notoriety of Mr. Steinmeyer.